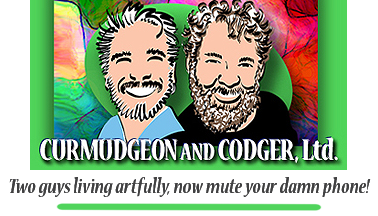 Blogs – Curmudgeon and Codger, Ltd.
Khrysso Heart LeFey and Grey Forge LeFey are both writers who think out loud. They post on life issues, their personal lives, their thoughts, the arts, encouragement and pro-active positivity. Khrysso is forthright with some strong opinions and you can follow him at Khrysso.com. Grey is all about the colors, baby! And he addresses life with humor at Grand Bohemia.com.